The HTTPS protocol is a standard security technology used to establish an encrypted link between a web server and a web client. HTTPS facilitates secure network communication by identifying and authenticating the server as well as ensuring the privacy and integrity of all transmitted data. Since HTTPS prevents eavesdropping on or tampering with information sent over the network, it should be used with any login or authentication mechanism and on any network where communication contains confidential or proprietary information. To encrypt communication between the ArcGIS Web Adaptor and Portal for ArcGIS, the use of HTTPS is required. This ensures that names, passwords, and other sensitive information cannot be deciphered as they are sent between ArcGIS Web Adaptor and the portal. When you use HTTPS, you connect to your web pages and resources using the HTTPS protocol instead of HTTP. The use of the default HTTPS port 443 is appropriate for the vast majority of users. In some rare cases, an ArcGIS Web Adaptor instance cannot use port 443 on its web server for organization-specific reasons. If this applies to your organization, see Use non-default ports for the portal's ArcGIS Web Adaptor, which details additional steps to configure a workaround. You need to obtain a server certificate and bind it to the website that hosts ArcGIS Web Adaptor. Each web server has its own procedure for loading a certificate and binding it to a website. Ensure also that your web server is set to ignore client certificates in order to correctly access secure services over HTTPS. To be able to create an HTTPS connection between ArcGIS Web Adaptor and your portal, the web server requires a server certificate. A certificate is a digital file that contains information about the identity of the web server. It also contains the encryption technique to use when establishing a secure channel between the web server and the portal. A certificate must be created by the owner of the website and digitally signed. There are three types of certificates—CA-signed, domain, and self-signed—which are explained below. Certificate authority (CA) signed certificates should be used for production systems, particularly if your deployment of the ArcGIS Enterprise portal is going to be accessed from users outside your organization. For example, if your portal is not behind your firewall and accessible over the Internet, using a CA-signed certificate assures clients from outside your organization that the identity of the website has been verified. In addition to being signed by the owner of the website, a certificate may be signed by an independent CA. A CA is usually a trusted third party that can attest to the authenticity of a website. If a website is trustworthy, the CA adds its own digital signature to that website's self-signed certificate. This assures web clients that the website's identity has been verified. When using a certificate issued by a well-known CA, secure communication between the server and the web client occurs automatically with no special action required by the user. There is no unexpected behavior or warning message displayed in the web browser, since the website has been verified by the CA. If your portal is located behind your firewall and using a CA-signed certificate is not possible, using a domain certificate is an acceptable solution. A domain certificate is an internal certificate signed by your organization's certificate authority. Using a domain certificate helps you reduce the cost of issuing certificates and eases certificate deployment, since certificates can be generated quickly within your organization for trusted internal use. Users within your domain will not experience any of the unexpected behavior or warning messages normally associated with a self-signed certificate, since the website has been verified by the domain certificate. However, domain certificates are not validated by an external CA, which means users visiting your site from outside your domain will not be able verify that your certificate really represents the party it claims to represent. External users will see browser warnings about the site being untrusted which may lead them to think they are actually communicating with a malicious party and be turned away from your site. Successful completion of the ArcGIS Enterprise configuration wizard requires HTTPS to be enabled in IIS on the machine where the base deployment is installed. The Web Adaptor URL https://mymachine.mydomain.com/server cannot be reached. Please check that HTTPS has been enabled for your web server. For instructions on enabling HTTPS, navigate to the Help Topic: Introducing ArcGIS Enterprise > ArcGIS Enterprise Builder > Plan a base deployment. In most cases, your IT administrator will give you certificates and bind them to HTTPS port 443. In 2017, Chrome began only trusting certificates with a Subject Alternative Name (SAN) parameter, which cannot be configured when creating a certificate in the IIS Manager application. If you are using IIS and need to create a domain certificate, see Create a domain certificate, which provides a script to run on your machine that will create the appropriate certificate and bind it to HTTPS port 443. Creating a self-signed certificate should not be considered a valid option for a production environment as it will lead to unexpected results and a poor experience for all users of the portal. A certificate signed only by the owner of the website is called a self-signed certificate. Self-signed certificates are commonly used on websites that are only available to users on the organization's internal (LAN) network. If you communicate with a website outside your own network that uses a self-signed certificate, you have no way to verify that the site issuing the certificate really represents the party it claims to represent. You could actually be communicating with a malicious party, putting your information at risk. Web browser and ArcGIS Desktop warnings about the site being untrusted. When a web browser encounters a self-signed certificate, it will typically display a warning and ask you to confirm that you want to proceed to the site. Many browsers display warning icons or a red color in the address bar as long as you are using the self-signed certificate. You should expect to see these type of warnings if you configure your portal with a self-signed certificate. Inability to open a federated service in Map Viewer, add a secured service item to the portal, log in to ArcGIS Server Manager on a federated server, and connect to the portal from Esri Maps for Office. Unexpected behavior when printing hosted services and accessing the portal from client applications. Inability to sign in to the portal from Esri Maps for Office unless the self-signed certificate is installed into the Trusted Root Certification Authorities certificate store on the machine running Esri Maps for Office. The above list of issues you will experience when using a self-signed certificate is not exhaustive. It is recommended that you use a domain certificate or CA-signed certificate to fully test and deploy your portal. Once you've created a self-signed certificate, you'll need to bind it to the website hosting ArcGIS Web Adaptor. Binding refers to the process of configuring the certificate to use port 443 on the website. The script in the Create a domain certificate topic will bind your certificate for you. The instructions for binding a certificate with the website vary depending on the platform and version of your web server. For instructions, consult your system administrator or your web server's documentation. 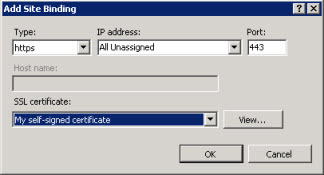 For example, the steps for binding a certificate in IIS are below. Select your site in the tree view and in the Actions pane, click Bindings. If port 443 is not available in the Bindings list, click Add. From the Type drop-down list, select https. Leave the port at 443. If port 443 is listed, select the port from the list and click Edit. From the certificate drop-down list, select your certificate name and click OK.
After obtaining or creating a certificate that is bound to port 443, you can configure your Web Adaptor for use with the portal. You will need to access the ArcGIS Web Adaptor configuration page using an HTTPS URL such as https://webadaptorhost.domain.com/webadaptorname/webadaptor. After you've configured your Web Adaptor, you should test that HTTPS is working properly by making an HTTPS request to the portal website, for example, https://webadaptorhost.domain.com/webadaptorname/home. If you are testing with a self-signed certificate, dismiss the browser warnings about untrusted connections. This usually involves adding an exception to your browser so that it will allow you to communicate with the site that is using a self-signed certificate. To learn more about using SSL in your portal deployment, see Security best practices.